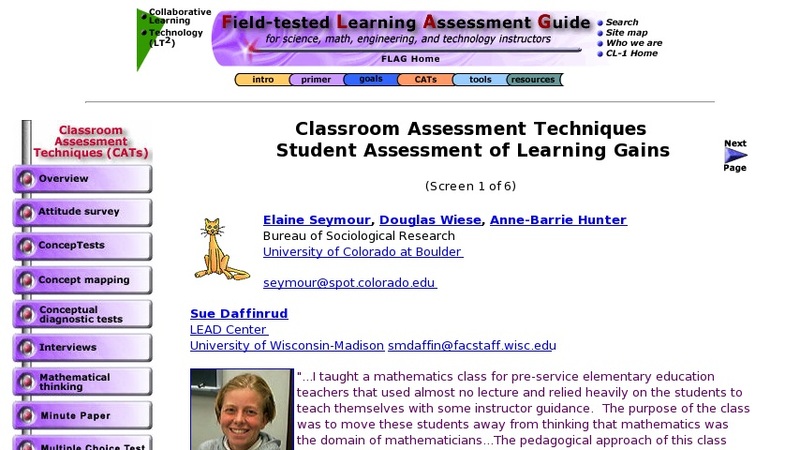 This page describes an assessment tool called Student Assessment Learning Gains (SALG), one of a series of Classroom Assessment Techniques (CATs) provided by the Field-tested Learning Assessment Guide (FLAG) website. The CATs of FLAG were constructed as a resource for science, technology, engineering and mathematics instructors to emphasize deeper levels of learning and to give instructors valuable feedback during a course. The SALG is a web-based instrument consisting of statements about the degree of "gain" which students perceive they have made in specific aspects of the class, and provides instant statistical analysis of the results. This site provides an overview of this assessment technique including information about why the SALG instrument is beneficial to use and how to use it. The site is also linked to a set of discipline-specific "tools" that can be downloaded for immediate use, as well as supplementary links and sources to further explore this assessment tool.